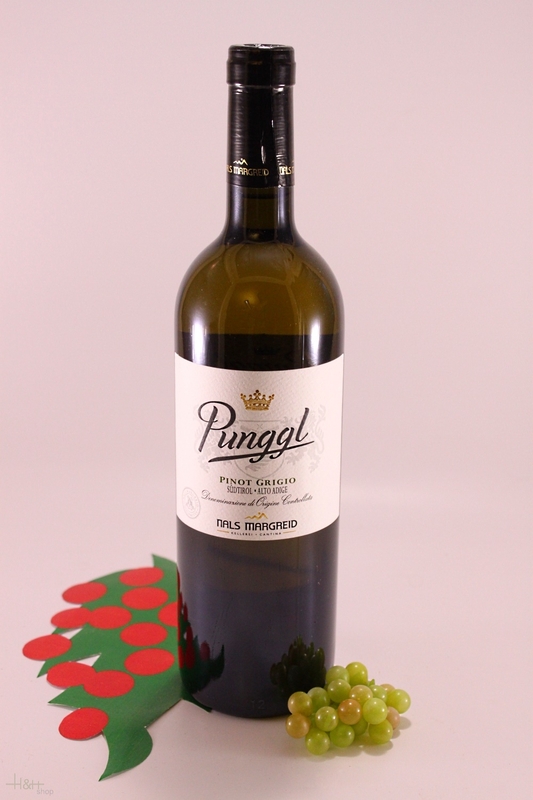 The Pinot Grigio ‘Punggl' grows in fertile highly clayey grounds southern Magrè. 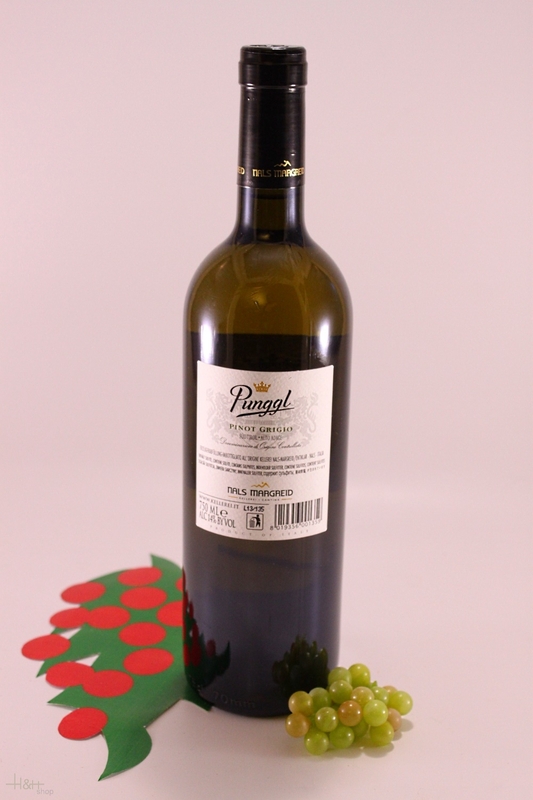 The aromatic fruity taste is marked by honey, nuts and flowers giving elegance and charm to this wine. Its taste is full on the palate, with notes of minerals and an intense and persistent structure. "Wine & Spirits Magazine" has rated the wine "Kellerei Nals Margreid Punggl Pinot Grigio Sudtirol - Alto Adige, Trentino-Alto Adige, Italy" from the vintage 2015 on 01.10.2016 with 87 of 100 points. "Falstaff Magazin" has rated the wine "Kellerei Nals Margreid Punggl Pinot Grigio Sudtirol - Alto Adige, Trentino-Alto Adige, Italy" from the vintage 2015 on 06.07.2016 with 91 of 100 points. "Wine Enthusiast" has rated the wine "Kellerei Nals Margreid Punggl Pinot Grigio Sudtirol - Alto Adige, Trentino-Alto Adige, Italy" from the vintage 2014 on 04.01.2016 with 90 of 100 points. "Falstaff Magazin" has rated the wine "Kellerei Nals Margreid Punggl Pinot Grigio Sudtirol - Alto Adige, Trentino-Alto Adige, Italy" from the vintage 2014 on 23.06.2015 with 91 of 100 points. "Falstaff Magazin" has rated the wine "Kellerei Nals Margreid Punggl Pinot Grigio Sudtirol - Alto Adige, Trentino-Alto Adige, Italy" from the vintage 2013 on 24.06.2014 with 89 of 100 points. "Huon Hooke" has rated the wine "Kellerei Nals Margreid Punggl Pinot Grigio Sudtirol - Alto Adige, Trentino-Alto Adige, Italy" from the vintage 2012 on 12.06.2014 with 92 of 100 points. "Vinum Wine Magazine" has rated the wine "Kellerei Nals Margreid Punggl Pinot Grigio Sudtirol - Alto Adige, Trentino-Alto Adige, Italy" from the vintage 2012 on 01.02.2014 with 15 of 20 points. "Wine Enthusiast" has rated the wine "Kellerei Nals Margreid Punggl Pinot Grigio Sudtirol - Alto Adige, Trentino-Alto Adige, Italy" from the vintage 2012 on 06.01.2014 with 91 of 100 points. "Wine & Spirits Magazine" has rated the wine "Kellerei Nals Margreid Punggl Pinot Grigio Sudtirol - Alto Adige, Trentino-Alto Adige, Italy" from the vintage 2011 on 01.08.2013 with 91 of 100 points. "Falstaff Magazin" has rated the wine "Kellerei Nals Margreid Punggl Pinot Grigio Sudtirol - Alto Adige, Trentino-Alto Adige, Italy" from the vintage 2012 on 25.06.2013 with 90 of 100 points. "Wine Spectator" has rated the wine "Kellerei Nals Margreid Punggl Pinot Grigio Sudtirol - Alto Adige, Trentino-Alto Adige, Italy" from the vintage 2011 on 30.04.2013 with 88 of 100 points. "Luca Gardini" has rated the wine "Kellerei Nals Margreid Punggl Pinot Grigio Sudtirol - Alto Adige, Trentino-Alto Adige, Italy" from the vintage 2011 on 02.11.2012 with 88 of 100 points. "Falstaff Magazin" has rated the wine "Kellerei Nals Margreid Punggl Pinot Grigio Sudtirol - Alto Adige, Trentino-Alto Adige, Italy" from the vintage 2011 on 11.07.2012 with 91 of 100 points. "Wine Enthusiast" has rated the wine "Kellerei Nals Margreid Punggl Pinot Grigio Sudtirol - Alto Adige, Trentino-Alto Adige, Italy" from the vintage 2011 on 08.01.2012 with 92 of 100 points. "Wine Enthusiast" has rated the wine "Kellerei Nals Margreid Punggl Pinot Grigio Sudtirol - Alto Adige, Trentino-Alto Adige, Italy" from the vintage 2010 on 03.01.2012 with 89 of 100 points. "Falstaff Magazin" has rated the wine "Kellerei Nals Margreid Punggl Pinot Grigio Sudtirol - Alto Adige, Trentino-Alto Adige, Italy" from the vintage 2010 on 13.07.2011 with 89 of 100 points. "Wine Enthusiast" has rated the wine "Kellerei Nals Margreid Punggl Pinot Grigio Sudtirol - Alto Adige, Trentino-Alto Adige, Italy" from the vintage 2009 on 11.01.2010 with 90 of 100 points. "Wine Spectator" has rated the wine "Kellerei Nals Margreid Punggl Pinot Grigio Sudtirol - Alto Adige, Trentino-Alto Adige, Italy" from the vintage 2006 on 15.11.2007 with 87 of 100 points. "Stephen Tanzer" has rated the wine "Kellerei Nals Margreid Punggl Pinot Grigio Sudtirol - Alto Adige, Trentino-Alto Adige, Italy" from the vintage 2010 with 92 of 100 points. "CellarTracker" has rated the wine "Kellerei Nals Margreid Punggl Pinot Grigio Sudtirol - Alto Adige, Trentino-Alto Adige, Italy" from the vintage 2013 with 90 of 100 points. "Stephen Tanzer" has rated the wine "Kellerei Nals Margreid Punggl Pinot Grigio Sudtirol - Alto Adige, Trentino-Alto Adige, Italy" from the vintage 2006 with 88 of 100 points.